"There are two myshnayot that the Tanaim are teaching in that matter and they are called Hekhalot Rabbati and Hekhalot Zutarti and that is well known. About these contemplations said the Tana, "four entered the orchard" it is also explained in that Baraita, Rabbi Akiva spoke to them "When you come to the place of the pure marble plates then do not say: Water, Water'. In Hekhalot Zutarti it is said: the entrance of the sixth palace looks like thousands and ten thousands of waves of water but there is not one drop of water only an air of splendor from the pure marble paving stones with an appearance like unto water". Except for this quote relating to the gate of the sixth palace which gives us our only textual touchpoint as to the indentity of the text, we possess no further positive evidence as to its contents, its beginning or its end, its character or its form. In the principal manuscripts of the Hekhalot Literature we do not find a text entitled Hekhalot Zutarti. The true identity of the text should be questioned since its existance is based on such slender evidence. A. Jellinek was the first to suggest that certain fragments of Oxford manuscript 1531 is Hekhalot Zutarti. This identification together with its parallels in other manuscripts, has been accepted in a l l subsequent research. The survey of the manuscripts containing the Hekhalot tracts does not verify this arbitrary assumption since the passages containing Hekhalot Zutarti, according to Jellinekfs suggestion , do not present a continuous composition or a textual unit but rather a conglomeration of somewhat related bits and pieces . In the Hekhalot Zutarti as identified by Jellinek there are several different strata of Merkaba tradition unrelated as to author, chronological date of writting , and of form. We find about ten non successive passages a l l beginning with the words ״Rabbi Akiva spoke:" There is no continuous plot to bind these fragments as a whole and further in the Hekhalot literature we find many other and similar paragraphs which are also attributed to Rabbi Akiva. There are other portions of Hekhaloth Zutarti which can be found in some texts comprising the Hekhalot literature such as: "Shiur Quoma", Sar Torah", "Metatron", "Ezekiel's Chariot" and the long lists of secret names of the Deity and his wardens. The editorial considerations, therefore , for including each particular passage in Hekhalot Zutarti are not readily appearent and the compilation of these fragments in to a structural whole must seriously be questioned. This author sees them as most probably representing various mystical traditions from different circles of Yordi Merkava, copied in a haphazard manner with no attempt to attain textual unity . Hekhalot Zutarti should not be considered as an unfolding narrative or book but rather different forms of literature which grew from a nucleus of idea , situation , or perhaps a true mystical experience and to which has been grafted, with the passing o f time, other similiar traditions and new material. If these passages must be seen- as a unit, then their nucleus must be the well known archtypical mystical experience of Rabbi Akiva - the four who entered the orchard - since their uniqueness is obviously founded on the visionary experience. However, it is doubtful that at any time these parts were truly compiled together in a more coherent manner than we now possess. It has been accepted in previous research that Hekhalot Zutarti is the oldest text of this literature , however, no philological analysis has ever been attempted to prove this the thesis.Taking into consideration the nonhomogeneous character o f the text as described above, no generalization as to the antiquity of the text as a whole should be made. Several negative generalizations can be infered , to wit: Hekhalot Zutarti does not reflect a specific time or historical occurance; it is lacking any eschatological orientation or apocalyptical characterizations as found in other texts of Hekhalot literature; and, it is lacking any literary framework binding its various parts. Perhaps the only true connecting link , excepting the central position of Rabbi Akiva, is the importance stressed on the mystical meaning inherent in the secret and sacred names of the Deity. This critical edition of Hekhalot Zutarti is based on the Jewish Theological Seminary manuscript 8128 and the different variations as found in the other major manuscripts, it also contains the abridged contents and detailed notes, and includes an introduction dealing with the various aspects and problems as outlined in this summary. Elior's critical edition of the Hekhalot Zutarti was published before Schäfer's Synopse zur Hekhalot-Literatur and it remains an important resource, albeit one that had become hard to find. It is good news that Magnes Press is making it available again, and at a very reasonable price. Has Dig been reading The Treatise of the Vessels? TELEVISION: TV’s ‘Dig’ unrolls a Dead Sea Scroll to unravel a conspiracy (Kimberly Winston, Religion News Service). Key to the advancing of the already complicated “Dig” plot is something referred to as the “war tablet.” Supposedly written by the Essenes, the tablet is supposed to be stored at Jerusalem’s Israeli Museum and is said to contain a code that will reveal the hiding places of 12 precious stones. (XII) And in addition twelve fine stones were transmitted by the hand of Heleq son of Shimmur the Levite, by his hand to preserve them and to return them to the tribes, those on which the names of the tribes were engraved, which used to shine over the heads of the tribes, increasingly outstanding and precious in their value, vying with one another. And no king or prophet or man knew in which place these were hidden, except Heleq son of Shimmur the Levite. It looks to me as though the writers of Dig have read this and have incorporated it into their storyline. This should be fun to follow. More on Dig is here and link. More on the Copper Scroll is here and links. My translation of The Treatise of the Vessels received some media attention early in 2014 when someone noticed that it claimed to tell the hiding place of the Ark of the Covenant. You can read about that and lots of additional background on the text here and links. CAVE RAIDER: Man arrested for attempting to loot antiquities from northern underground cave. Extensive, irreversible damage caused to site carrying remains from Roman, Byzantine, and Ottoman eras (Daniel K. Eisenbud Jerusalem Post). According to spokeswoman Yoli Schwartz, the incident took place near Afula, in the Jezreel Valley, on Tuesday night when the suspect, in his 50s and from a nearby Arab village, was found by Border Police and IAA officers with digging tools at the ancient ruins site. “The suspect dug deep underground from 2,000-year-old holes in an attempt to get to an area below the hole that probably served as a storage unit in ancient times to find remnants that could be sold on the black market,” Schwartz said on Thursday. SAD NEWS: Assyrian Patriarch Passes Away (AINA). Chicago (AINA) -- The Patriarch of the Holy Apostolic Catholic Assyrian Church of the East, His Holiness Khanania Dinkha IV, died Thursday at 10:04 AM at the Mayo Clinic in Rochester, Minnesota. The cause of death was a virus infection and pneumonia. The Bishop of India, Mar Aprim Mooken, will serve as acting patriarch until a new patriarch is elected. What was the afikoman originally? ASKING THE IMPORTANT QUESTIONS (PASSOVER EDITION): Where does the afikoman come from? Surprisingly to modern Jews who assume it's a half-piece of matza, we do not know what the original intention was: interpretations range from roast pigeon to afterparties (Elon Gilad, Haaretz). 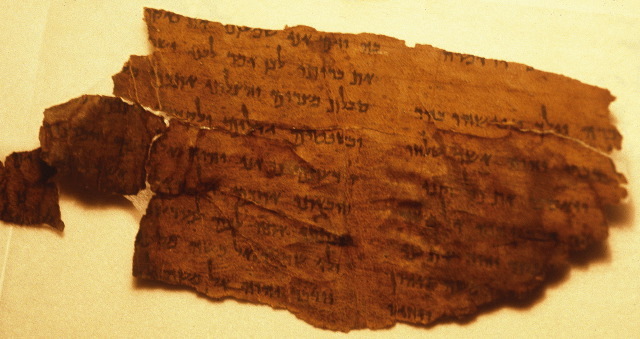 Perhaps the most surprising aspect of the afikoman, a half-piece of matza that gets "stolen" and hidden during the Seder ceremony and then is found and ritually eaten for dessert, is that its origin is a dictate in the Mishnah, which explicitly states: "One should not have any afikoman after the Passover sacrifice" (Pesahim 10:8). So how did one rabbi's "don't" become everyone's "do"? But actually there is no consensus on what was the afikoman actually was. Some think the original reference was to a dessert after the Passover meal, while others believe it refers to Grecian post-feast debauchery. It seems that even the students of Rabbi Judah the Prince, who compiled the Mishnah in approximately 200 CE, didn’t know what he meant either, as the Talmud (500 CE) preserves the answers of three of his students to the question “What is an afikoman? The Babylonian Talmud was redacted somewhat later than that, and there is no guarantee that its traditions about R. Judah's disciples, who lived centuries earlier, are accurate. But by the time of the Talmud's traditions it seems that that there was no longer a clear memory of the meaning of the word in the context of Passover. Read the whole article for the history of the development of the modern custom. Reminder: with free registration you can read the full text of a limited number of Haaretz articles each month. NOT LETTING THE TERRORISTS WIN: Why Terrorists Attacked Tunisia’s Museum Extremists are afraid of the country’s democracy (Yassine Brahim, Wall Street Journal). When violent minorities seek to undermine peaceful majorities, the best response is to not change course. That’s why in Paris, the Charlie Hebdo magazine defiantly published another edition soon after the attack on their offices, and thousands marched in solidarity with them. In Ottawa, after a soldier was killed at Canada’s national war memorial, other soldiers swiftly took his place on ceremonial duty. And in Boston, the first marathon after the bombing was one of the biggest ever. In the same spirit, the Bardo museum that was attacked has re-opened its doors. This museum reflects the melting pot of civilizations that have influenced our nation, including the Greek, Punic, Roman and Islamic. One of the most popular exhibits is an ancient mosaic depicting Virgil with the muses History and Tragedy standing to either side of him. It is a fitting symbol. We can continue to make history, or succumb to tragedy. I know what choice Tunisians will make, but we will need continued support at this challenging time. Background to the Tunisian attack and the other recent militiant-Islamist assaults on the past is here and links. AWOL: Agade List Archive at the SBL. The posts in Jack Sasson's prolific Agade e-mail list are being collected and archived by the Society of Biblical Literature from now on. The archive will eventually include all postings back to 2010. Chuck Jones also notes that Agade posts going back to 2011 are available on Twitter. BREAKING ISRAEL NEWS: New Details Emerge on Rebuilt Altar of Jewish Holy Temple [PHOTOS] (Ahuva Balofsky). Some additions and corrections to the earlier announcement that the Temple Institute has built an altar it says is suitable for use in an actual Temple. Background, commmentary, and additional links here. H-JUDAIC: Internet Resource: Index of Bibliographic References to Talmudic Literature. The Index is a comprehensive online research tool directing the user to discussions and interpretations of Talmudic passages found in both modern academic research and medieval Talmudic scholarship (Geonim and Rishonim). By clicking any Talmudic passage, the user will receive a list of specific books and page numbers within them discussing the selected passage. EXPLORING OUR MATRIX: Redeeming Gnosticism. James McGrath notes the "Gnostic Countercultures: Intrigue and Terror" conference at Rice University, which begins today. He also has links to various Gnosticism posts, including one from yours truly. The idea that Jewish law can be unjust, that we have evolved a moral sense more complex and advanced than biblical codes can contain, is not at all a modern invention. Two thousand years ago, Philo of Alexandria was already reading the Exodus story as a philosophical allegory of individual spiritual liberation. Eight hundred years ago, Maimonides theorized that many Jewish laws were instituted solely to distinguish Judaism from paganism, not because they were inherently moral. Yet Philo and Maimonides were equally quick to insist that their revisionist explanations of Jewish law did not compromise the authority of that law: Whatever the reasons for the law, it had to be obeyed to the letter. What is modern is the idea that we have the right to legislate for ourselves. Secure in that freedom, I think it is possible to read the Talmud with the necessary combination of respect and distance. ANCIENT JEW REVIEW: AJR receives American Academy for Jewish Research Grant. EXCAVATION: Porcupine unearths 1,400 year old oil lamp at archaeological site in Emek Hefer (Jerusalem Post). Archaeologists with the Israel Antiquities Authority (IAA) have uncovered a 1,400 year-old ceramic oil lamp with the help of an unlikely aide – a porcupine. OLD TESTAMENT PSEUDEPIGRAPHA WATCH: David Threlfall's Noah Begs Modern Questions (Jonathan Romain, Huffington Post). It seems the BBC has a documentary about Noah airing on 30 March and those responsible have been reading their pseudepigrapha. The first [novelty about the documentary] is that it answers one of the great mysteries about the Noah story. We know who was in the ark; Noah and his wife, along with his three sons, Shem, Ham and Japhet and their wives...so, the names of all the men, but what was Noah's wife called? If Mrs Noah was one of the few people righteous enough to be saved in an otherwise wicked world, then surely she is important enough to have a name? The BBC have come up with an answer, based on the Book of Jubilees (4.33) in the Apocrypha - a collection of books from the biblical period that were not included in the Bible itself, and so are regarded as interesting but not sacred. Apparently, her name was Emzara, which - in husband and wife shorthand - becomes 'Emmy' and so along with other famous biblical couples such as Adam and Eve, Samson and Delilah, we can now add Noah and Emmy. HAPPY TWELFTH ANNIVERSARY TO PALEOJUDAICA! Below is a list of my favorite PaleoJudaica posts from the last twelve months. Some are just notices of important stories, but most involve more of my own commentary than usual. And when there are links, be sure to follow them for more information. Past anniversary posts are here and links. New Jesus document? Sadly, no. Posts on the Babylonian-Judean cuneiform tablets: start here and follow the links. Posts on ISIS's desecration of Jewish, Christian, and Pagan historical heritage in the Middle East: start here and follow the links. Could the ancients see blue? YONA SABAR: Hebrew word of the week: Pardes (Jewish Journal). The Hebrew word pardes has come up in PaleoJudaica off and on with reference to the Story of the Four Who Entered Paradise (see here and here and links) and also with reference to the concept of "Paradise" in general. Note also the synchronicity of the book My Father's Paradise by Ariel Sabar, Yona's son (see here and links). Follow the link for a description. Posted by Yale News. IN OSLO IN JUNE: STUDYING ANCIENT MAGIC: Categorisation – Comparison - Materiality. Follow the link for a call for papers. EUANGELION: Book Notice: The Text of the OT. The Text of the Old Testament: An Introduction to the Biblia Hebraica. 3rd Edition. Revised and expanded by Alexander Achilles Fischer. Translated by Erroll F. Rhodes. Grand Rapids: Eerdmans, 2014. 363 pages. ARCHANGEL METATRON WATCH: Jealous girlfriend erases game from boyfriend’s phone, destroys relationship in process (Evie Lund, RocketNews24). It all started with the mobile game Puzzle & Dragons, aka Pazudora. Apparently, the jealous girlfriend of this story just couldn’t handle her boyfriend paying so much attention to something other than her when in her company, so while he was in the bathroom, she DELETED the app from his phone. But let’s not judge her before we’ve heard her account of the story, okay? The chief point of dissension seems to have been the character Metatron in the game. To be fair to the girlfriend, the Metatron in question is very female and very pneumatic. I've relayed many strange Metatron stories over the years, but this one is certainly a contender for the strangest.